It's that time again to share some fabulous modern sewing finishes and guess who doesn't have anything to share? Meee. In fact, I have yet to touch my sewing machine since I got back from Sewing Summit. Second fact, my suitcase is still packed. :) Oh well. I'm hoping to get back sewing sometime this week. 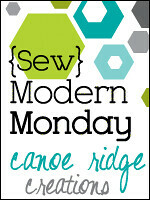 Enough about me, lets get to the fun part -- your modern sewing finishes! Just remember to please include a link back to this post in your own blog post. Thanks for hosting another party!! I love seeing what everyone makes. I had 3 things to post about this week...hope that's okay! Well good luck, whatever you've got up your sleeve! Welcome back! No finishes for me either, let alone any progress. I am, however, 1 step ahead of you b/c I unpacked....yesterday :) I'm a bit concerned, as the lack of need to unpack just might speak to my overloaded closet. Perhaps a purge is in order? Congrats on the secret quilty dreams progress! Can't wait to get some sneak peeks! Thanks for hosting. Love your "quilty dreams" post -- you can do it. Well it sounds like you have been busy enough! :) thanks for your linky party, it's really fun! Wow --- Lots of wonderful projects this week!